This will be a quick summary of and a few photos from my trip to Hong Kong, Macau and China in December 2000. The three chapters are divided up by location and subject. Part One covers Hong Kong and Macau where I spent about a week. Part Two covers Xiamen, which is right across the straits from Taiwan, in the province of Fujian where I spent about two weeks. Part Three is the only place you'll actually find anything having to do with Wushu. While in Xiamen I visited the Beijing Wushu Team, who was down there training for the winter. It was a really action packed trip, so I can't even begin to give a complete account of everything I did and saw, even if I had a lot of spare time to work on this, which I don't. Also I actually didn't take a lot of photos either. If you're wondering about the title up at the top - that's from one of the many bizarre signs I've found in China, a few of which I will share here. That particular one is from a park in Xiamen. The Chinese directly translates to 'Beware of pierced foot.' 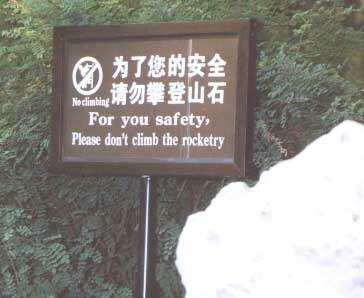 But I think my all time favorite is this one I found in Beijing in '99.